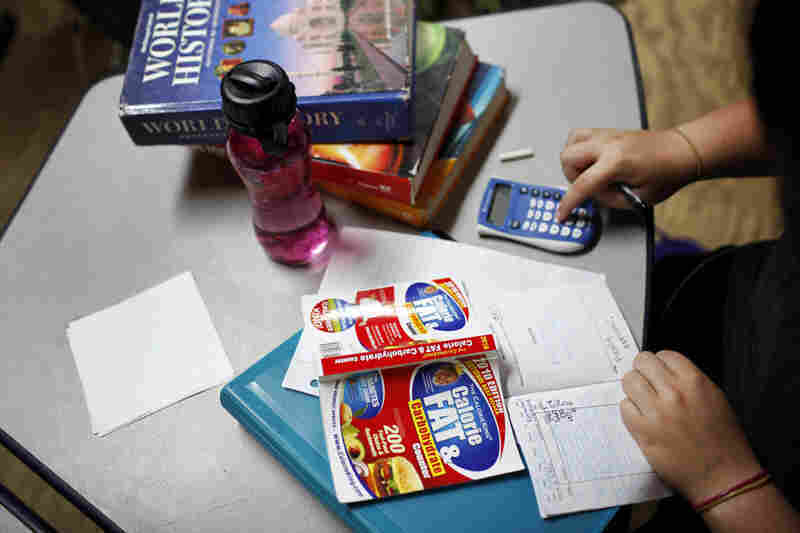 School Transforms Teens' Lives, One Pound At A Time In a nation where child obesity rates are soaring, some parents are turning to a boarding school that focuses on both weight loss and academics. The goal: to rewire students' eating and exercise habits to ensure they live long and healthy lives. The kids find it a challenge — but totally worth it. 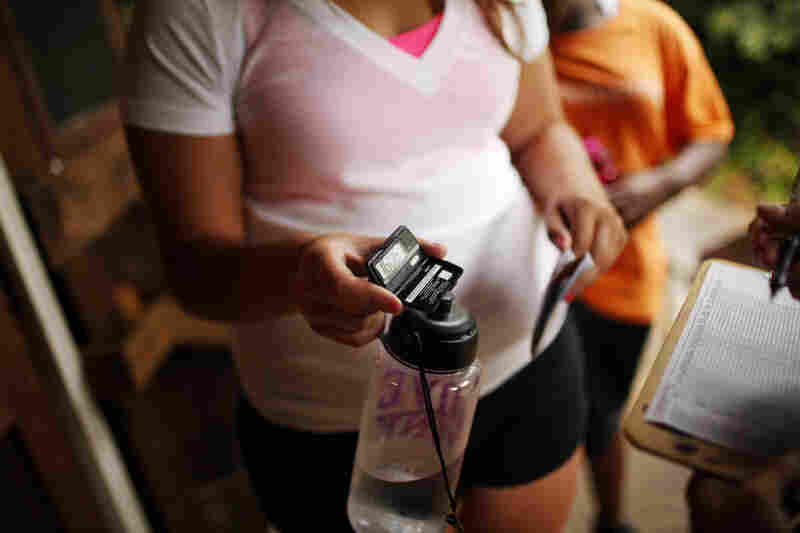 An NPR series looks at how obesity is changing the ways Americans live, work, eat and travel. 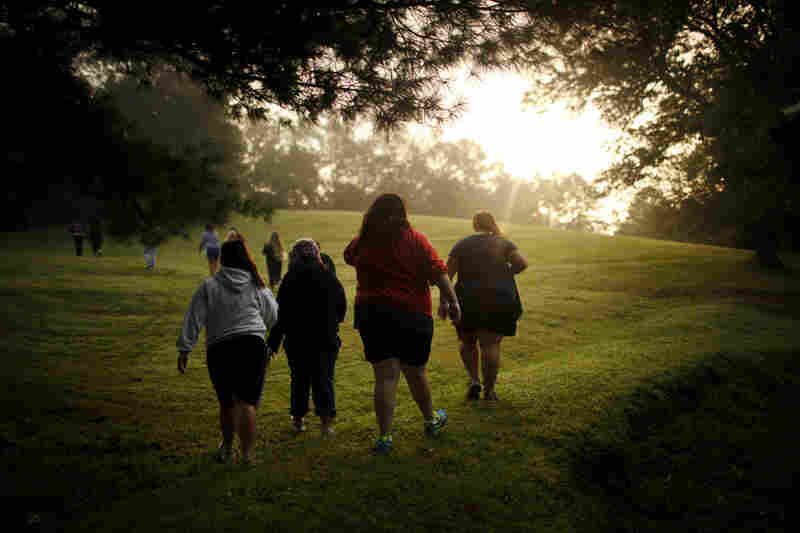 Students walk through the scenic campus of Wellspring Academy, a boarding school for overweight children, located near Asheville, N.C. In addition to taking regular academic classes, students learn to control weight through a healthful diet, exercise and counseling. Students do high steps on the tennis court. Exercise is paramount at Wellspring, and a little rain doesn't get in the way of outdoor activities. Healthful dieting is more than half the battle. Every calorie and gram of fat is strictly monitored by the staff at Wellspring and carefully recorded by the students. Here, Savannah Davis finishes her dinner with broccoli. Wellspring students wear pedometers and are required to take a minimum of 10,000 steps each day. 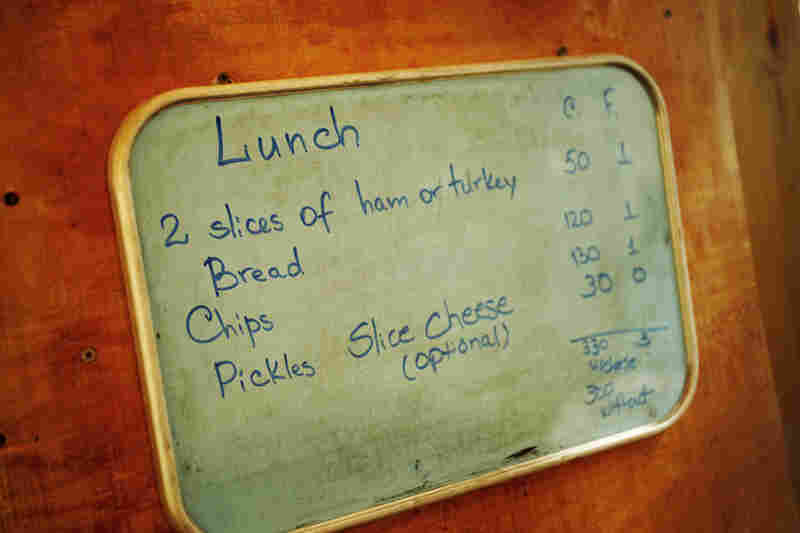 A board in the cafeteria breaks down the calories and fat grams for each meal. A full salad bar is always offered. 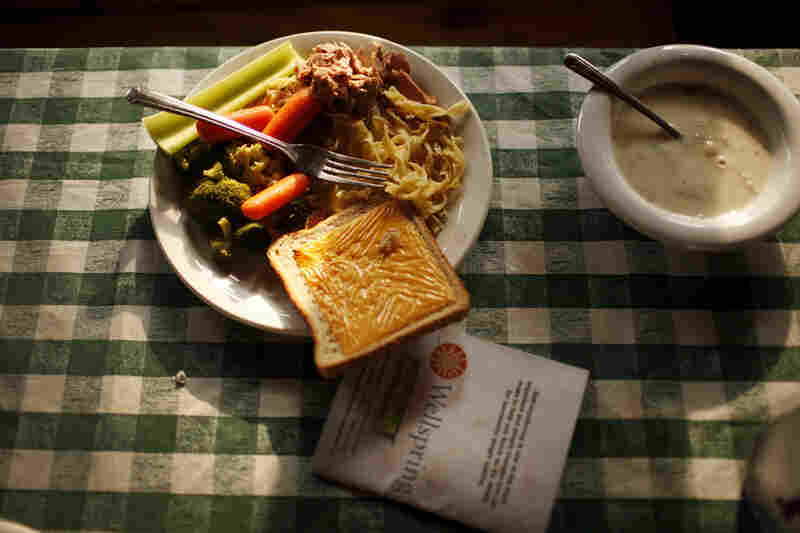 Students aim to consume 1,200 to 1,400 calories per day, a dramatic change for most of them. Jade Tapia, 14, cries as she says goodbye to her father just after arriving on the Wellspring campus in August. If students make enough progress in the first eight weeks, they earn the right to go home for the weekend or to go out to eat with their visiting families. Academics are rigorous at Wellspring. Here, students sit in a math class on campus. With a maximum campus enrollment of 50 students, class size is generally very small. Savannah Davis calculates her calorie and fat intake during a free moment. Wellspring students go for a swim in the lake just before sunset. 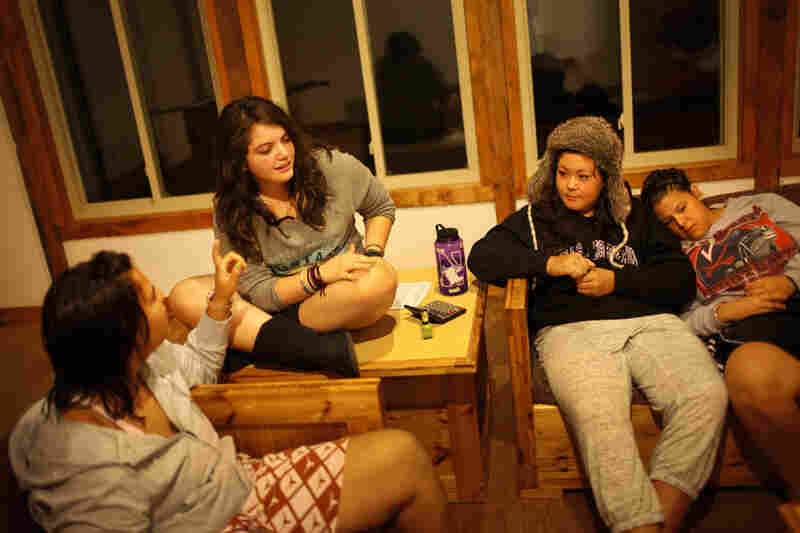 Bethany Gomez (from left), Ana Pierdant, Rachel Fujiyoshi and Jessica Wiegel swap stories and paint fingernails in their dorm before lights out. Savannah Davis (second from right) walks with her friends to the cafeteria. In the five years of its existence, Wellspring has earned a reputation for teaching overweight children to prefer healthful food and exercise. Living Large: Obesity in America is a collaboration between NPR and the Public Insight Network from American Public Media. To become a source in the Network or to learn more, click here. And if obesity has touched your life, share your story here. The gravel road announces families' arrival at Wellspring before they actually get there. As cars begin to pull up the breathtakingly narrow, windy roads that lead to school, the thrumming of cicadas is temporarily eclipsed by the crunch of tires on gravel, then the slam of car doors. Teens cross the green lawns, often with parents and siblings in tow, to check in on a rustic front porch of what looks like a big log cabin. There they receive a schedule and make their way to Tammy Olivier, Wellspring's office manager and HR director. As "Miss Tammy" — honorifics are standard here; everyone is addressed as Miss, Mr. or Coach — welcomes the students, she asks them to catalog all the things they normally can't live without. "Just write down what you brought with you, like your laptop, your cellphone, camera, Kindle, stuff like that," Richards says, pointing to the clipboard where all the valuables will be listed. "We'll put them in here," she says as she points to small plastic bin with a snap-close lid, "and label them, and give everything back to you when you leave." This scene — minus the electronics appropriation — is replayed during move-in day on hundreds of campuses across the United States at the beginning of the school year. But this isn't just any campus — this is Wellspring Academy of the Carolinas, a boarding school designed to help overweight and obese students lose weight while also teaching traditional academics. And these teens aren't just any teens; they are kids who are seriously overweight, sometimes so much so that their lives are endangered. Wellspring is the one place in the world that might be able to, finally, help them take — and keep — the weight off. Being here makes these kids special, but being overweight doesn't. According to the Centers for Disease Control and Prevention, about 30 percent of American teens are overweight, and it's pretty easy to guess why: too many sodas and high-calorie snacks; too much sitting before the computer and the TV; too many PE classes cut because of budget demands. The result: spiking numbers of teens with diabetes and increased risk of adult health problems like cardiovascular diseases, arthritis, cancer and stroke. Some of the students here have dieted on their own, done programs like Weight Watchers, or seen nutritionists, which brought temporary loss that eventually led to weight regain. Wellspring, tucked away in the foothills of the Blue Ridge Mountains near Asheville, N.C., promises no coddling, no distractions and a lot of hard work. And, says Director David Boeke, the school's very isolation is what allows its students to succeed. "You can't do that when you're at home and always being interrupted by school, or the birthday party or the normal day-to-day events," Boeke, says, waving to returning students who are helping newcomers with their bags. "Here you're able to focus on yourself and do what you need to do to learn and be successful." Like traditional boarding schools, there is a full day of classes and tutoring, so students will be current with what their schools are studying when they return to them. Students here range from middle school through high school. "Students are not just spending a few weeks of their summer working at trying to get healthy quickly," Richardson says. "They're investing a big chunk of their life in change and habits that will allow them to have permanent and long-lasting effects in their weight control." The school has rolling admissions. Most kids come for the fall or the winter semester — or both. It's a commitment of time, of energy and of a significant amount of money: A year at Wellspring costs about $62,500 — more than many four-year colleges. Some insurance companies will pay for the counseling services that are built into the curriculum, but that's less than a quarter of the total cost. Richardson admits the school gets its share of well-off students, but kids whose families are struggling financially manage to come, too. Wellspring is featured on the Style Network's reality series Too Fat for 15, which chronicles teens' lives as they lose weight. Here are clips from the show — including tips on eating and working out from former and current Wellspring staff. "We've seen families who've had fundraisers with their churches [to help]. Many of these families have spent their retirement or all their children's education funds to come here," Richardson says. "Many of our families have said: 'This is your college, and we know we're adding years to your life. So this is more important now, and we'll figure out your education in the future.' "
The big question is: After all this money and time and effort, is a stay at Wellspring worth it? Bethany Grace Gomez, 16, says yes. A vivacious girl with a quick smile and flashing dark eyes, Bethany came all the way from Galveston, Texas, to continue her work at Wellspring. She started last spring and says it was excruciatingly hard at first — the calorie restriction, the daily exercise, the myriad rules and the elimination of normal daily distractions like TV and her cellphone. From an angry girl who was more than 100 pounds overweight, she has morphed into a friendly, outgoing young adult with a much slimmer profile. Between her two months at Wellspring Academy in North Carolina last year and six weeks at a Wellspring camp over the summer, Bethany says, "I lost about 65 pounds, and I'm about halfway there." She says people often ask her the is-it-worth-it question. "This has honestly made me a different person. It's not only helped me with my weight loss; it's also helped me become more mature, because I'm away from my family. It's preparing me for college life, because I'm in a dorm. I'm just so grateful for this experience." She's hoping she'll spend one more semester here, then return home to her family. "I love it here, but I'm ready to do the work and then move on with my life," she says. Haley Humphrey, 15, of Athens, Ala., lost about 34 pounds at a Wellspring camp last summer. Linda Humphrey has come this first day with her daughter Haley, 15; they're both friendly, with an unmistakable Alabama twang. Linda expects Haley to be here "at least a semester." Haley did a Wellspring camp, too, and her mother says the end-of-summer results were gratifying. "She lost about 34 pounds in six weeks, her body mass index went down a few points," Humphrey says. Haley is "a lot healthier, and a lot happier with herself and who she is, which has been a great thing for us." It's what other parents are hoping for their children, too. Sydney Applebaum's parents, Meryl and Mitch, flew from Boston with their young son, Matt, to sign up Sydney, who is 16. When asked what she hopes Sydney will get from her stay here, Meryl tears up and waves to her husband to speak for them both. "We hope she learns about herself, and makes the changes that she really wants to make," Mitch says, looking fondly over at his oldest child. And what if some of those changes involve revamping the family's diet once Sydney returns home for good? "Hopefully she'll learn a lot here, and return to teach some of that to us," Mitch says with a wink. "The first 16 years, we were teaching her. Now it's her turn to time to pay it forward, so to speak." If obesity has touched your life, share your story with NPR and the Public Insight Network.